The Institute for Psychic Reform is apparently a somewhat eclectic, loosely formatted collective based around the person of Alan Evil in Louisville, Kentucky, USA. 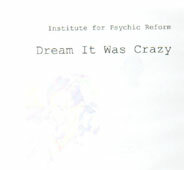 Dream It Was Crazy is their latest effort, a long ambient set that begs comparison to Chill Out, KLF's 1990 classic. Like that older album, this is ambient in the sense that structure is barely there, not in the sense that it is necessarily relaxing, peaceful music. This is music that flows, seemingly organically. You never know what is going to come up next, and there are many layers of sound, so even if you spend several days just sitting and listening, you will still discover new things. Due to this "collage" nature it is difficult to discuss songs. There aren't really "songs" in a traditional sense, just as there aren't really melodies in a traditional sense. Oh sure, there are themes and sounds that reappear periodically, but they do not constitute some nugget that you can hum as you go about doing your housework. This just isn't that kind of music. And that will dissapoint, annoy, or frustrate a wide range of people. If you are one of those people, then this really isn't for you. If, however, the collage nature that i have described appeals to you, then i think this is a great release to check out. It is well done, and contains lots of interesting sounds. It is not so much a directed journey as Chil Out was (that album being a collage based on a hypothetical train ride across America. Silly Brits -- as if you could ride a train across this country....), but is more like, well, like you are sitting somewhere, and a wide range of things occur around you. There is one loud theme that reappears periodically, constructed out of loud, bellowing keyboard hits. This sound reminds me of some loud machine, like a street cleaner or something. So, in a sense, what this is like is like sitting on a bench in a park and just listening. This album was recorded live and direct to two track and was created with minimal mastering and editing. When you get down to it, that is pretty durned amazing considering the flowing nature of this piece. No, really: Chill Out was crafted on computer, and this album has a very similar feeling. There are loops and sounds and instruments that flow in and out of focus. To think that The IFPR did that live is kind of amazing!